Olive 06HD review | What Hi-Fi? As CD sales continue to slump, it’s no surprise that music servers are increasingly important components for hi-fi enthusiasts. 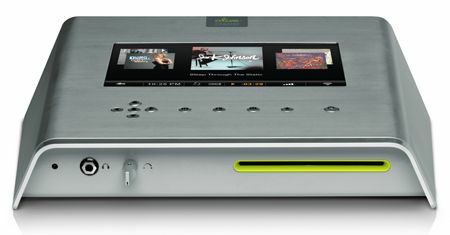 Of course, you can store music on a PC or Mac and use a media streamer such as the Naim NDX, but some will prefer the convenience, quality and style of a music server. And those descriptions certainly apply to the Olive 06HD: this 2TB design has capacity for up to 6000 albums, and it performs every bit as well as it looks. Of course, those looks are key to another major asset of the 06HD – its 10.1in screen is an ergonomic delight – but what lies beneath is almost as compelling. Solidly constructed from aluminium, the Olive includes separate power supplies for its analogue and digital sections, a custom-built toroidal power supply and high-grade capacitors throughout. The 2TB hard-drive is cushioned by eight layers of noise-cancelling padding and cooled by a fanless passive venting system – so mechanical noise is kept to an absolute minimum. And specially designed vibration-resistant feet allow the Olive’s chassis to ’float’, helping to decouple it from the effects of external vibrations. As you’d expect, the digital-to-analogue conversion is just as potent. The 06HD uses a fully balanced differential DAC design based on 24-bit/192kHz Burr-Brown PCM1792 DACs, plus an additional, dedicated 1792 specifically for the headphone output. Add an ultra-low-jitter master clock, a Texas Instruments SRC4194 Asynchronous Sample Rate Converter and an extensive array of high-quality audio outputs, and it’s plain that the 06HD means business. It sounds great, too. High-resolution music works best, of course: the Olive comes preloaded with 10 tracks in 24-bit/176.4kHz quality, and will support content up to 24-bit/192kHz. Listening to these high-res files, there’s a terrific sense of transparency (even with complex instrumentation) and dynamic range. Switching to ripped CD-quality files isn’t quite so stunning, of course, but it’s still hugely impressive, with the Olive’s imaging and timing satisfying on every level. It isn’t as fleet-of-foot or unreservedly dynamic as the Naim NDX, but there’s genuine warmth and musicality to its sound that we’d imagine many listeners will find just as compelling. And with its network streaming (via wired or wireless links) and internet radio, you’ve a complete, utterly desirable alternative to a regular CD player.